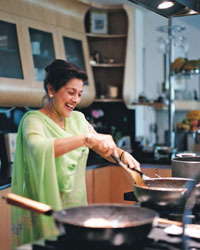 L.A.-based cookbook author Neelam Batra gives Indian food a California-style makeover, making it lighter and brighter. Neelam Batra didn't really start cooking until she moved from New Delhi to Los Angeles as a bride. Batra learned quickly and ended up writing cookbooks; the most recent is the encyclopedic 1,000 Indian Recipes. Today she entertains at least 10 friends at her house as often as three times a week and even caters the engagement parties of friends' daughters. Breaking with Indian tradition, she cooks with little saturated fat, favoring oil over butter in spicy chicken curry and adding yogurt instead of cream to sweet new potatoes with velvety spinach.